Welcome back! After the second week of spoilers where all 184 cards were spoiled by the end, here is a look at some more of the cards from the set. 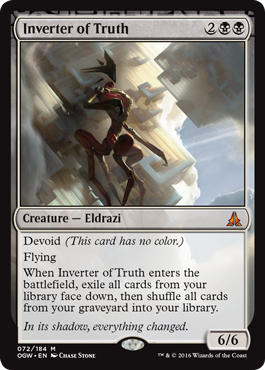 Inverter of Truth is definitely an interesting card. It's a 6/6 for four mana, has flying, and makes your graveyard your own library. 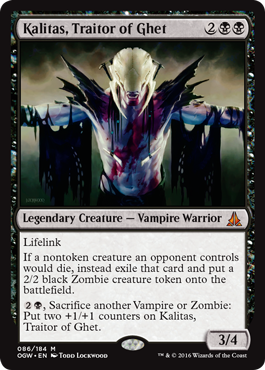 This seems like a graveyard mechanic to feed Shadows over Innistrad, although it's a great endgame for Limited. Might even be the next Desecration Demon for Standard. 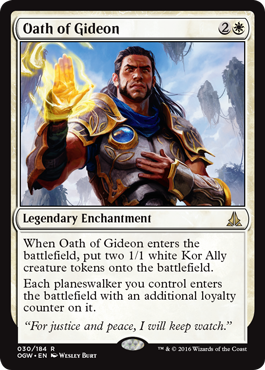 Kalitas is powerful, but I'm unsure how useful he will be for Standard, but a 3/4 with Lifelink is strong for Limited, especially when it creates creature tokens when an opponent's creatures die. A three mana board wipe that fits into a burn deck or an Eldrazi deck. It may not be ideal to the goal of a burn deck, but taking out threats serves a useful purpose. In a Modern Urzatron deck, this is perfect, especially when there are a couple of Eldrazi in Tron decks capable of triggering the graveyard ability. Chandra, Flamecaller is powerful but costs a bit much to be useful. Two 3/1 red Elemental creature tokens with haste is indeed strong for the cost and is more for late game, Commander, or Limited, but not very useful outside of that. The 0 ability for discard is great especially after emptying a hand or having a hand with just lands late game. Either way, you will at least draw one card. The -X ability is pretty cool as a board wipe. From the beginning, it's basically two Kozilek's Returns in one card. 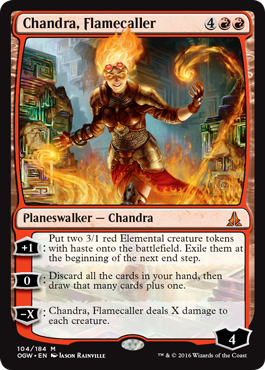 This version of Chandra is well rounded, but costs too much to be useful in competitive play. World Breaker, while powerful, is too costly for Standard use. 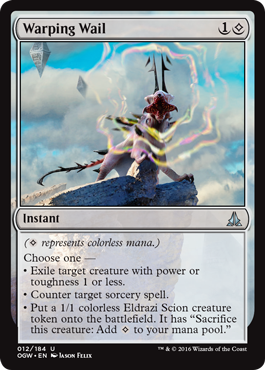 If you consider the use of Eldrazi Scions, it becomes easier, however I've never successfully been able to keep any Scions around long enough to cast something. That could be my failing with the deck I built, or the metagame was far too aggressive for me to keep up without blocking with every Scion I created. Anyway... a 5/7 that has Reach, exiles a non-creature permanent upon entering the battlefield, and then being able to bring it back to your hand from the graveyard by sacrificing a land is strong. I'm sure there's a purpose for it, I just haven't found it yet. 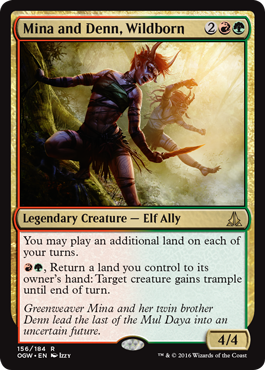 Mina and Denn is really strong providing additional lands and also providing trample to creatures by returning a land to your hand. There is plenty of opportunities to abuse them in Commander, especially paired with Amulet of Vigor and the bounce lands. Definitely a powerful card for an Ally deck or perhaps even a Modern token deck. I like it. 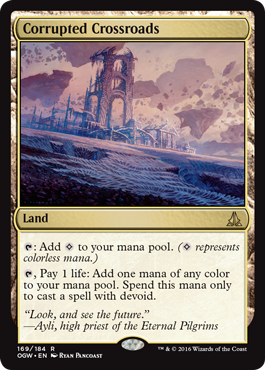 A land specifically for Eldrazi in Standard. 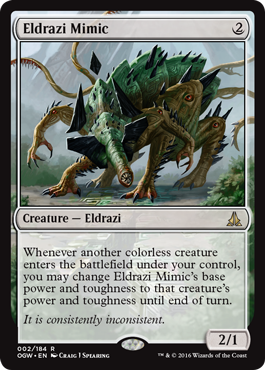 I don't see it being useful outside of that, although it could find purpose in Modern Eldrazi. While it provides two extra bodies, it is also somewhat powerful for boosting planeswalkers, but at the same time, not many decks play a large number of planeswalkers, thus making this a card that isn't likely to be played in Standard. Two mana for three damage to a creature is normal for a burn spell, but then the ability deals two damage to each opponent when casting a planeswalker. 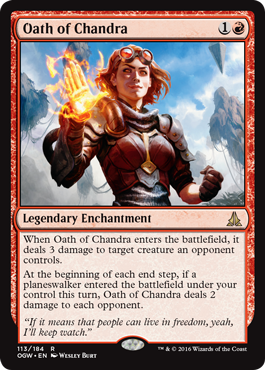 I get the theme and story aspect of the Oaths, however they have a singular purpose and that requires planeswalkers to be useful. 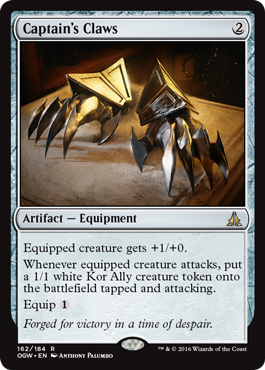 I see them more as a group of cards for Commander as you could easily build a superfirends deck. I love this card and see it as being a chase uncommon in the set. Two mana to exile a creature, counter a sorcery, or put a Scion onto the battlefield. It's simple and it's useful. 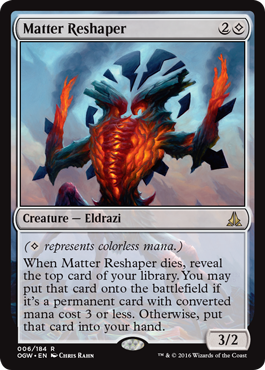 Of course, it's pointless without a way of making colorless mana, but that's easy even in Modern without using Wastes. All it takes is a painland or even a filterland. A two mana creature that gains the power and toughness of any colorless creature you play. Sure it's only for a turn, but imagine playing Ulamog and attacking with a 10/10 without needing Ulamog to have haste. Definitely useful for Standard, likely useful in Modern too, especially with the emergence of Eldrazi decks and could even be useful in Tron. One damage every turn, even the ones that aren't yours. Or prevent a creature from attacking or blocking. Or draw a card. Pair it with being a 5/5, it's great. Perfect for Standard Eldrazi decks. Three mana for a 3/2 is great, but when this dies, you either draw a card or get to just drop a permanent onto the battlefield. Lands have a CMC of 0 by the way, so it's possible you could get a free land out of this one. For this week, that's it, but I'm hoping to ramp up article writing and at least get something out each week. My dry erase board is full of ideas, I'll just have to get some time to write them all down.